/ Modified dec 1, 2017 1:36 p.m. 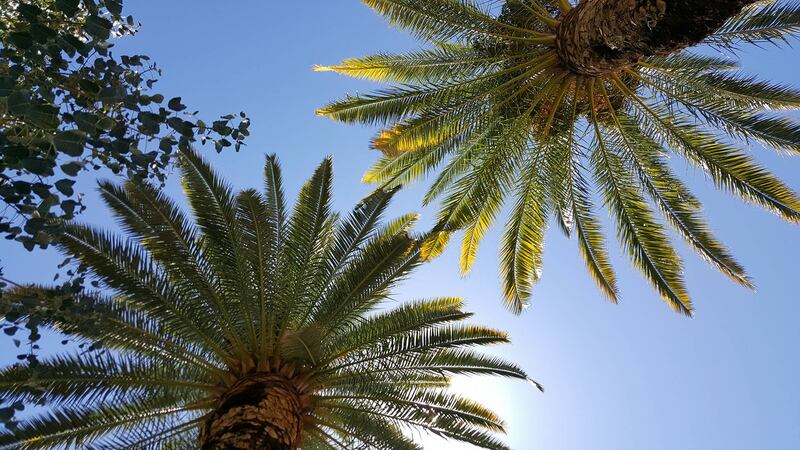 Looking up into the canopies of two palm trees on a warm spring day. November joined the ranks in 2017 as among the warmest months on record, with Tucson's temperature averaging about 4 degrees above normal. This year could end up as the warmest ever. “We had quite a few days with temperatures we don’t usually see during the month of November. We had some highs in the 90s, quite a few 80s," said National Weather Service meteorologist Dan Leins. Earlier in the year, March and June also set all-time-high average temperature records. Another record-setting month in 2017 was July, the wettest, with 6.8 inches of rain recorded at Tucson International Airport. Leins said La Niña conditions in the Pacific Ocean will affect the upcoming winter months. "It tends to result in about average temperatures, maybe slightly above normal. It also tends to be drier than normal. Certainly not saying that we’re not going to get any precipitation this wintertime, but the signals would suggest it’s probably going to be warmer than normal and drier than normal," he said. Leins said if conditions continue to stay above normal through December, this year will surpass 2016 as the all-time warmest in Southern Arizona.